Vintage Art Deco Gatsby Celluloid Womens Mens Sunglasses Tortoise 1920s 1930s . Shipped with USPS First Class Package. Good condition with very minor scratches not hindering sight. Easy to see clear in these. One arm end is slightly warped. Total width hinge to hinge 6" Lens width 2" Arm length 4 1/2"
Beautifully design, many colors, inside has cloth label Made in France. Well cared for over the years, clean, no odors. This is a Trinity purse from the late 1920's or early 1930's. From the top of the strap to the bottom is 10", the widest part of the bottom is 10". It is well marked with the Trinity label. It is flaking off most of the mirror. Vintage Stetson Medalist Fedora Brown Teardrop Philadelphia 1930s. Shipped with USPS Priority Mail. 3RD PAIR: FUL VUE. TOP PAIR: AO. ALL MARKED 1/0 12K GF. 4 PAIR WIRE RIM EYEGLASSES. 2ND PAIR: LOOKS LIKE CC. These glasses are in good condition for their age. The lens look good. One ear piece needs a little oil on the hinge to make it easier to move. The case is not as good as it is rusty. The nose piece is missing. One small. Art Deco with 6 beaded bees! Small interior coin purse with beaded. coin purse inside. Lining of brown silk. The color of bag and silk handle?. Hinges on large bag excellent. 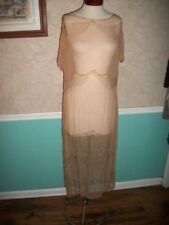 Needs to and needs to be restrung.VTG 1930’s FACETED CRYSTAL FLAPPER PURSE BAG OR FLAPPER HAT. NO MORE EXCEPTIONS. Many signed and unusual pieces. Our offices are smoke free, but can not account for previous owners! VINTAGE 20's 30's WILSON MOTORCYCLE GLASSES AVIATOR SAFETY GOGGLES. See pics for futher details including size. Shipped with USPS First Class Package for Free! Thanks for looking..Buy it now or make offer! Hinge to hinge: 117 mm. They have green lenses, are round, and have fold back sides. The interesting thing about these lenses is that the ear pieces actually fold to the front. The lenses have GH inscribed on them as shown. Still in usable condition with no missing beads or breaks. Unique design and color will make you stand out from the boring crowd. No labels, but this matches the designs from this era- so doing my best guess to identify. It does not have any other issues. It is clean inside. 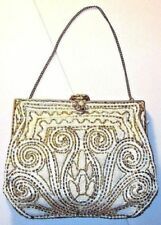 Up for auction is a women’s vintage Guild Creations brand Art Deco Purse. The material is a black fabric consisting of either Rayon, Silk or Acetate. The beads appear to be all there. No holes, snags or tears. The purse comes with two compact mirrors. The purse from top of handle to bottom of purse is 14” long and the purse body is approx 10”x10”. If you have any questions please feel free to ask. Good luck bidding and thank you for visiting my no reserve auction. They are in remarkable condition, especially given the age. The celluloid lenses are a golden beige color and lenses (unscratched) a soft brown. Lenses used and in good conditionwith no scratches ,with leather case, 12K Go ld f il l.
Red velvet lining. Very similar to the bag Elizabeth Taylor cherished as one of her favorites. One of a kind. THE ZIPPER CLOSURE NEEDS TO BE OPENED AND CLOSED PER THE ZIPPER HANDLE AND NOT BY THE CHAIN ATTACHED. I HAVE SHOWN IN PICTURES #7 & 9 THE FABRIC INTERFERING WITH CLOSURE WHEN USING THE CHAIN. (4 PAIR WIRE RIM BAUSCH & LOMB EYEGLASSES. PLUS PROVIDE PHOTOS FOR YOUR VIEWING. I AM VERY EASY TO WORK WITH :). Vintage PLASTIC Tortoise Shell CHUNKY Fabric STRAP Handbag Purse Braun L@@K! Up for bid: Vintage PLASTIC Tortoise Shell CHUNKY Fabric STRAP Handbag Purse Braun. Very cool vintage purse. Approx measurements. 8.5” long x 5.5” tall. Please use multiple photos to help describe overall condition. Plastic is warped on ends as shown. Purse still locks on one ball on top. May be able to heat up plastic and bring back together? Fabric sides and strap. Fabric is good some discoloring in fabric. Hard to find purse. Inside shows some rust on metal bars. Great addition to your collection or display. Please contact me with any questions before bidding. Please pay within 48 hours of winning bid. Please check out my other listings. Thanks! Happy bidding. They are marked,B&L HiBo 1/10 12KFG. They embossed case is in fair condition. This is a beautiful antique beaded comb holder with the original Bakelite comb from the 1930's. The bead work has a floral motif, and is in very good condition with no missing beads. LOVELY LITTLE HINGED EVENING BAG 6.5" X 5 3/4". THE LINING IS TORN-SEE LAST 3 PICS. ALSO A RED MARK ON THE BOTTOM CORNER OF THE ONE SIDE-PIC #1. Very light and comfortable to weary. Beautiful purse. There are patches where there are missing beads from age. I’ve shown it in pictures. The hanging tassel has some missing beads. The inside has stains. Length of the body of the purse is 8”. Drop is 8”. Width is 5”. Please ask all questions before bidding. HAS A DOUBLE GOLD COLORED CHAIN. See all photos. Chain link strap and a wonderful cabochon stone clasp, which functions well. Interior fabric very clean and totally intact, with a side pocket. Label is missing, likely made in Austria. Interior is lined with a dusty rose colored fabric; interior slip pocket and cloth MADE IN AUSTRIA label. Manufactured by Graceline. The peach satin liner is in great condition with no tears or dry rot. Marked Haynes Brothers, Red Oak Iowa. It was very well taken care of. I am not able to read the maker. Looks like it may say Serson or Dobson. 4 Vintage/Antique Purses and Necklace. Shipped with USPS First Class Package. Fabric: Not sure. This is crocheted with gimp cording. The inside is lined in dark maroon or brown. Condition: The bag is in good condition. (SEE PHOTOS) Lining is in very good condition. Strap Handle: Crochet cord. The fabric tapestry looking Petit Point purse has ornate gold plated hardware, textured chainlink strap, pleated mirror pouch and kiss lock closure. The beaded bag white seed beads interspersed with gold seed beads, all attached to a gold fabric base. I am selling the Vintage Genuine Alligator Coin Purse and Wallet. This item measures approximately 2 3/4" wide, 5" tall, and 1" thick. The wallet has several pockets as well as a change purse. The outside is in good shape. The inside needs a light cleaning. One of the pockets also has been torn on each side (see photos). I do not see any maker's marks. 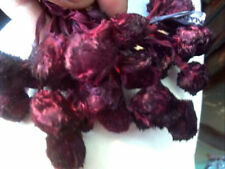 It has beautiful braid and is lined with satin. You can see by the condition of the inside band that it has not been worn. Size 6 3/4-6 7/8. Union label; made in the USA. "For God so loved the world that he gave his one and only Son, that whoever believes in Him shall not perish, but have eternal life. Vintage Art Deco Whiting & Davis Gold Mesh Bag. Evening purse with chain. The chain is in very good condition needs a some polish. Inside is nice with a little minor threads & discoloration to the silk.